With a name like Real Bout Fatal Fury Special you might think that the game is an update of something else from the series, much like how Fatal Fury Special was the second game with extra bits. 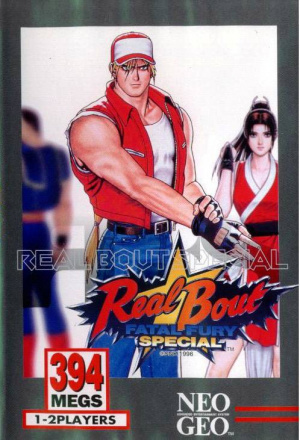 This, however, is its own thing, but although it's not an update of either of the other Real Bout games (and Real Bout 2 actually followed this one), it is not a completely dissimilar experience. 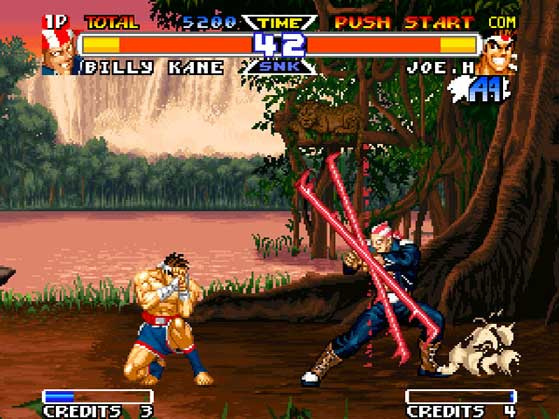 It is a one-on-one fighter after all and one where most of the fighters from the previous instalment are included. 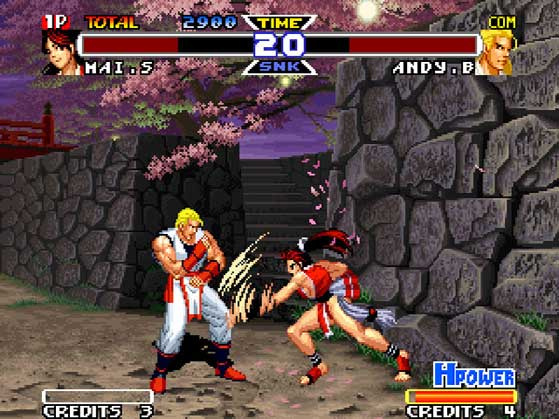 Geese Howard is gone (apart from as a hidden boss fight), but the rest of the Real Bout Fatal Fury gang has made it across. 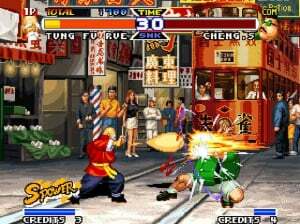 It’s not unusual for a sequel to bulk out the choice of fighters and that has happened here with the inclusion of four more characters last seen in Fatal Fury Special, including end boss Krauser. Via some button holding, four characters also have 'EX' versions available that come with some different moves to their regular variant. The EX characters may not be brand new fighting options, but they are still something to consider before embarking on your bottom-kicking adventure. As well as special moves, there’s a power gauge that can lead to you performing guard-cancelling Break Shots and powerful Super and Potential Power moves. While the core fighting is solid and feels like a refined system from a confident developer, SNK continued to be unsure what to do with the multiple planes used during the fights. 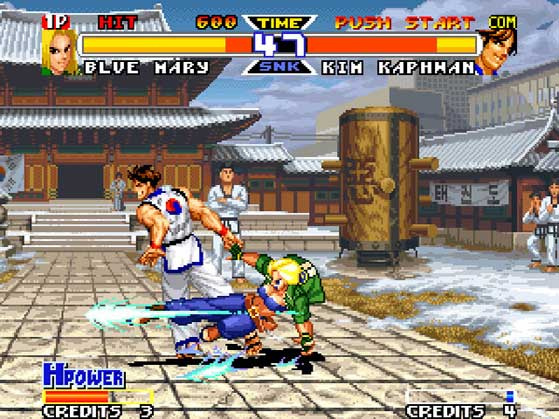 Having used a three-plane system for Fatal Fury 3 and the first Real Bout, here it reverts to a two-plane one. Being able to move into the foreground (as well as the background) may have seemed like adding an unnecessary extra evasive option, but the fact that characters automatically returned to the centre lane after a moment worked well to keep the battle moving. Characters no longer do that here, which feels like a bit of a step backwards, but attacks can be launched across planes and evolving mechanics over the course of the series have seen the pace of battle increase, so it doesn’t really slow things down the way it once did. Another change is the removal of out of bounds victories. Only featured in the first Real Bout game they provided an alternate way to win fights and were something to consider across multiple rounds. Here there is still some destructible scenery at the sides of stages, but while this can lead to a stunned opponent it can’t be used for a quick victory. The stages themselves look great, with a pan down at the start of the fight allowing you a good look at the detail in the surroundings. Different times of day are used across the different rounds and there’s a good range of locations visited from a lush beach to a busy Hong Kong street and a music venue with instruments and videoscreens set up, possibly for a post-fight gig. Krauser’s castle stage is suitably ominous and has a lady providing haunted vocals as a lead-in to Mozart’s Lacrimosa. Elsewhere, the music provides the usual energised tracks that work so well, with move-calls, thumps, crashes and groans also adding to the atmosphere. 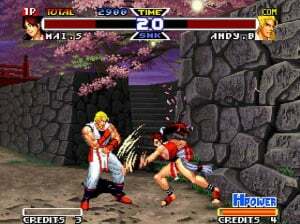 There’s some replayability in the single-player mode, such as trying to clear it with each of the characters, although the endings are quite basic, utilising victory artwork for a quick dialogue exchange. The difficulty is not too tough (certainly compared to some SNK fighters), but diving into the options menu allows you to adjust the challenge to your liking. Other options include turning the blood on/off as well as HAMSTER constants such as button remapping and the ability to add scanlines to the image. 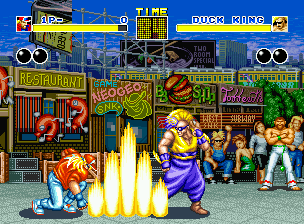 The usual one-credit Hi score and five-minute Caravan modes also feature but naturally most of the game’s replay value comes from battling against a friend, which can be done from them buying in to the regular arcade mode at any time. The 19 (plus four) characters provide a good variety of options for the fighting and the battles are as fun as ever thanks to the usual range of offensive options and evasive manoeuvres. The fun out of bounds victories from the first Real Bout game have gone and there's been a change to the multi-plane system, but there's still plenty of fighting thrills to be had here. 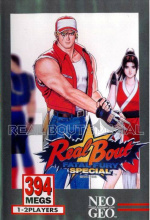 Real Bout 2 is ultimately a better game, but Real Bout Fatal Fury Special is still a solid fighter that can provide plenty of entertainment. Only 7/10 eh? Reading the review, it reads like a solid 8/10. Also from this point inwards is where SNK went crazy with their background artwork and put more emphasis on gameplay over story in the FF series. I think this one is a bit better than RBFF2 though, too much rush there. There is a character called DUCK KING? Dark Andy is best Andy. @Ooyah What? Duck King has been there since the first game. He's a Fatal Fury mainstay until Mark of the Wolves. I'll just play it on the Neo Geo Mini when it comes out. I honestly prefer this over Real Bout 2. I prefer its characters and some of the move sets, and IMO, it just flows better. Switch is my Neo Geo Pocket. I just wanna hug HAMSTER. I'm not really into fighters, so I was unaware. This can only be a good thing, though. 😊 Also... THERE IS A GOOSE! (Well... Geese). I wish there was a character called Chicken also. @retro_player_22 Oh, thanks for the clarification! I didn't see the "Special" on the end of the title. I like the intro for this game. Hopefully the next Real Bout game isn’t too far off. Nice job mentioning Krauser's track by name. I prefer the feel of RB2, but I love the presentation of this one (backgrounds and fighter intros etc) and 2 is definitely lacking in that department. This one needed more Geese. I would love to be able to combine my favourite elements of the three RB games (Geese, an option to have ring outs and the 3 planes from the first game, the presentation from this one and the fighting mechanics of RB2) into one. It would be nice of SNK to launch a 40% sale for the company's 40th anniversary, even if it lasted one week and doesn't happen again as it hasn't happened ever since ACA Neo Geo games started popping up. Then I'd buy a dozen games that otherwise I'll probably pass on, not for their quality, which is undeniable, but for the sheer number of fighting games there are on Neo Geo. Ultimately they all look the same more or less. @Ooyah Don't worry fighting games had a history of naming character after animals, even Street Fighter had Bison for a boss. This is my favourite FF game, unless you count Garou. Everything just feels "right" with this one, not sure how to explain it.